When we picked Sol up from her scope appointment at AVS we got to see pictures of her airway taken with the scope. I thought I would share the pictures with everyone as I think they give a pretty good idea of what the specialists can see with the scope. Below is a grouping of three separate pictures taken by the scope. 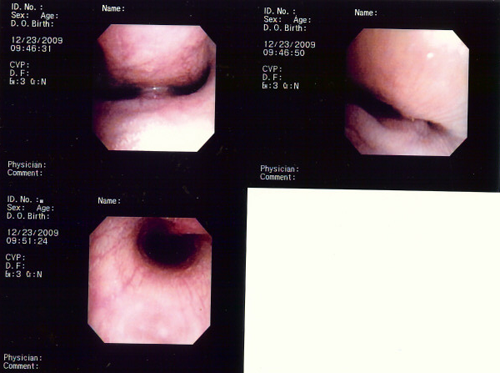 The two pictures on the top are of the area of Sol's airway where it branches off to her lungs. The third picture is from the middle of the trachea. You can see a slight collapse in the third picture, but the first two show just how bad the collapse is by her lungs. The airways around the branch should be circular. I have highlighted the collapsed areas as best as I could in the annotated picture below. Obviously the circles are not drawn to scale, but you get the idea. The airways should have a circular shape rather than an oblong shape. We continue to keep Sol in our thoughts and prayers. I hope she is comfortable. Such a sweet doggie. It is with a broken soul and heart that I come to you, my friends, this morning to say that my little boy, my love, my Riley was taken by God to rid him of his pain and give him eternal comfort. I do not have the strength to go into details…I don’t have the strength to breathe, but as I look into the big eyes that show nothing but knowing, understanding, longing, and confusion of Riley’s brother, Baxter, I have to. Please pray for my little angel…his pain has stopped, but mine is eternal. We love you all and thank you for your unwavering support, prayers, and love. You and your family are in our prayers. I pray that little beautiful Sol will be around for a long time and that the medication she is on will help her breathe easier. HUGS To you and your family. Happy Holidays. My heart goes out to Solsey and her family. I pray for Sol every day and I pray that she is comfortable. To Heather: My condolences to you in this terrible time. I pray that God will see you through. God bless you all. My heart is full of hope that the new meds will do the trick and Sweet Sol will be prancin’ and dancin’ through 2010. It seems you have really good veterinary facilities in your area, and I’m thankful, as well, that you’re able work at home to be a full-time nurse as well for your pug-pack. Extra New Year’s blessings to you all special prayers - just for Sol!! And to Heather: My heart aches for you. If I had a way to share it with you - I would send along a poem from a card I received when I lost my Molly-girl. Extra hugs for Baxter. My heart goes out to you and to Heather this morning. I am praying that Sol is comfortable and that the new meds do the trick and she is able to share fully in the new home she found just a year ago. Heather, I’m so sorry. I will continue to pray for you and Baxter. Know that little Riley is happy and healthy and enjoying himself as he waits for you and Baxter to be together again. Solsey we are hoping the meds will work for you. Heather I am just heartbroken for you. Dexter and I send pug hugs to all. I am so sad to hear about your doggie. I know if I lost Claude I would be heartbroken. I have had other dogs, but pugs seem to be extra, extra special. I know it will help to remember the all the wonderful times you had with Riley. We are all faced with the loss of a loved friend at some time, but the pain is still there. Give Baxter a big hug for me. I really want to stress just how much she is on my mind these days with this new development in her health. I even have people in my office asking about her!!! Please tell Sol that people luv her lots and keep her in their prayers. Heather, I am so devasated that Riley is gone. Last night, I was telling Sleighbelle that we had to pray for Riley and Sol and for their doctors to have the knowledge to help them. Having lost a beloved pug, I know that you are suffering, empty, lonely. But I think that having Baxter with you will help. Baxter will need his mom to love him and help him understand that Riley, while gone and in a better place, will never be forgotten. Know that everyone on the OBP website is thinking of you and praying for you. Corrine, I continue to pray for Sol and her doctors. You do have excellent specialists looking after her and I know that if there is something out there to help, they will find it. Do the doctors know what caused this in Sol? Is this something that is common in pugs? Amazing how much the doc can see with the scope - probably more than I see right now thru a blurr of tears. Miss Sol we wish you well and know that Mommy is doing everything she possible can for you. My heartfelt condolences to you Heather, I know your heart is broken. I still do not know what to say. These incidents are heartbreaking and words and tears cannot describe how much I ache for OBP and Heather. All I can do is pray to ease the heartbreak and suffering. Know that my heart is with you. Heather, there are NO words…only sadness. I am so sorry for your loss. My heart is broken. I will continue to pray for your emotional healing and I know that will take time. Angel Riley will be waiting at the Rainbow Bridge and what a happy day it will be for you when you are reunited. Hold fast to all of your precious memories, they will sustain you. If I could reach out and put my arms aroung you, I would! Trust that the little guy is in a good place and pain free and that, (if anything can be of comfort at this time), is a blessing. Everyone hug your babies! We just never know how long we will have them…Somehow, it seems really unfair that our furry friends live such a short time and that some of those years are plagued by ill health. Love your babies, enjoy every moment! Life is just too precious to let it slide by. Miss Sol, you hang in there! Remember, you are a tough old broad and this won’t get the best of you! I am so very sorry about Riley. He was a special little pug to you and also to all of us here in the OBP family. You have my prayers for strength and comfort. I hope that Baxter and you and your family can comfort each other. I’m so so sorry Sol has to deal with this. She is the sweetest little pug, and I follow her adventures religiously. I even have my other half asking “So how’s Sol doing today?”. I’m praying that she is still prancin’ around in 2010 and beyond. Hang in there Sol, you have a lot of people who love you. Corrinne, I don’t know how you do it, but the lengths you go to for your pugs is amazing. Please take care of yourself. Heather - My deepest condolences on the loss of your beloved Riley. May you be comforted by the loving memories you will always carry with you. Corrine - We, here in Southern California, have our fingers and paws crossed that the meds will do good and little Sol will breathe easier and feel better. It is heartwarming to know that you are there for her every step of the way and will make each day a special one for that special girl. Heather, my deepest condolences on the loss of Riley. Know that you are in my thoughts. I know the pain you are experiencing, there is nothing more painful than losing your beloved little boy. No words can take away the pain you are feeling. I have lost two of my pugs, and both times I wrote them a letter, in fact I wrote them almost every day in a journal, and it helped tremendously. I wrote to them telling them everything I wanted to say to them. Give it a try. I have those journals they are in my safe so that they will stay with me forever. Toni, that’s a wonderful idea about the journals. I wish I knew about that in the past when I’ve lost beloved animals. Just know Riley is dancing in heaven, and just waiting to see you again. May God give you comfort and peace. Corrine, our prayers are with you and Miss Sol, and Benny, Henry, and Miss Luna as they are feeling this too. Me and Gabe will be keeping will be keeping our paws crossed and also together hoping and praying for a full recovery. May God Bless you and Keep you. I haven’t been able to catch up on the blog in a while with the holidays and my husband and I were so surprised to see this post. Our Macy was diagnosed with a collapsed trachea on Monday. It was like reading about our last week exactly when I saw your last post. I’m so glad the Sol is improving. Macy is as well and we are being told it is just something we’ll have to manage throughout the rest of her life (she’s 7). Sol will be in our prayers. Macy sends her get well wishes. Those pics are amazing! Marty also has this problem, although not as bad. We are sure praying here that the drugs work for Sol and she is able to continue her wonderful life with your family! My little guy, Harry, is now 12 years old and has had the same problem for a little less than a year now. However, its getting worse and worse and it is worrying me more than ever. The phlegm (as I see it)that he tries so hard to cough up is just getting worse. It scares me and it scares him. I just moved to denver, co. and I don’t know any good vets here. I read all of Sol’s stories and I am so sad about Riley. We lost our third pug “duncan” in October right before moving to denver..His trachea basically was closing up and he couldn’t breathe. I am still in mourning and my other two pugs…harry and lulu are both 12 yrs. old too…As I read these blogs tonight I sat here crying. I can’t lose another one so soon and I am scared to death everytime harry starts choking…his choking is occcuring more often each day now…does anyone know a great vet in the denver area? My pug Gabby is having the same problem for about a week now and I can’t stand the thought of loosing her. She is my world. We can learn so much from a dog. I am so sorry for all of u that have lost a pet. I can’t imagine what it is like to go thru it. Although I know I will have to go thru it someday I hope I have more time with her. As I am a numbers guy, I am wondering what the odds r for a full recovery? Just read that the Missouri University Vet hospital has developed a surgery where they put a small spring in to open the trachea. However, my pug has advanded stage laryngeal collapse and I have no idea if a similar surgery would help her. The Pug Blog chronicles the daily antics of Benjamin, Henry, Luna & Sol.